Hello lovelies! I’ve set up the tree and the house is taking on that holiday feel. I think it’s time for another gift guide! This one will be all about Must-Have KBeauty Gifts, and this guide will be full of products that I have personally used and loved, and consider to be among my favorite KBeauty products. These are perfect for your friends who have just fallen down the rabbit hole of KBeauty and need Korean skincare recommendations! Best of all, most of these are very budget-friendly too! Some of these products were sent to me for free for an honest review; they are marked by an asterisk (*). Some of these links are affiliate links (I’ll get a small commission if you purchase through my link, but you don’t pay any more), marked by two asterisks (**). Belif is one of my favorite KBeauty brands — they’re kind of big-time with being offered at Sephora and believe me, they are worth the hype! I bought the Belif Moisturizing Bomb for myself for Christmas last year, and it was my go-to moisturizer last winter. It’s excellent for most skin types during the winter; probably normal to dry if you don’t live in a dry climate. Sephora has it in a pretty cute holiday set with two deluxe samples (the eye cream is the bomb). And the Witch Hazel Toner* they recently sent me is so moisturizing and lovely. I also LOVE LOVE LOVE their Chamomile Tincture (not pictured in this pic, but reviewed here). It’s a highly hydrating watery essence that you can use as a toner or first essence. It replenishes my skin without feeling sticky or heavy at all, and is the perfect first step in my skincare routine. Also, these trial size 10ml versions** make great stocking stuffers! I was introduced to Earth’s Recipe through Lisa at Bemused Korea (a kbeauty site with an amazing curation of natural Kbeauty brands — full disclosure, I worked for Lisa on writing the product descriptions on their site) and quickly fell in love with the Earth’s Recipe Energy Boosting Toner*. It is a very hydrating toner with the consistency of a thin serum. I can layer it on several times and my skin feels so plump and moisturized. The Gigawhite serum* is very moisturizing and has some lovely brightening ingredients. I liked the Earth’s Recipe toner so much I purchased the Earth’s Recipe Moisture Bound Cream as well. The cream has a lovely jelly texture and is perfect for my combination skin (though it may not be enough for dry skin). Earth’s Recipe is one of the brands “of the moment”, and I’m happy that the ingredients measure up! The basis of an effective skincare routine is proper double cleansing. 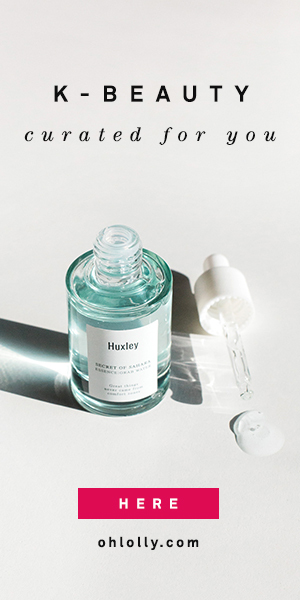 Remove makeup with the moisturizing Huxley cleansing water and then finish up with the gentle Huxley foaming gel cleanser. I think the Huxley cleansing water is the most moisturizing cleansing water I’ve used, making it excellent for dry skin. The gel cleanser is low-pH and very gentle, and is perfect for everyone. This is a wonderful gift for anyone who wants to start taking care of their skin after many years of neglect, or pretty much everyone. Everyone needs to wash their face, right? Two of my favorite products EVER are the Klairs Supple Preparation Toner** and the Klairs Freshly Juiced Vitamin E Mask**. The toner is super hydrating and is chock-full of hydrating, anti-aging, and brightening ingredients. It also absorbs SO perfectly into the skin without stickiness. This is probably my desert island product! The Klairs Freshly Juiced Vitamin E Mask is also in my regular rotation. This jelly-like sleeping mask leaves my skin so soft and silky smooth in the morning and has an amazing ingredients list. Pick up both together for excellent KBeauty gifts, or purchase one of the great sets that Wishtrend always has going on. Also, even at their regular price these products are a steal! Balm cleansers are a staple in a KBeauty double cleansing routine. These oil-based balms effortlessly dissolve makeup and rinse off cleanly. You may have heard of the Banila Clean It Zero and the Heimish cleansing balms, but I’m here to tell you that I like the Botanic Farm cleanser better than both of them. It has a silkier, richer, and more buttery consistency and leaves skin feeling moisturized. It’s also quite reasonably priced and would make a really lovely and useful gift. I certainly wouldn’t mind getting this under the tree, and it’s perfect for someone new to cleansing with an oil-based balm. I love the ethos behind Swanicoco — cutting edge skincare technology combined with gentle, plant-based formulations. The Fermentation Care Serum is so far my favorite product from them. It has a light but very hydrating texture and I find it calms down redness and makes my skin more even-toned. It may also have a slight brightening effect but it’s hard to tell since I exfoliate with AHAs as well. This KBeauty classic is perfect for the winter (and looks perfectly wintry too!). Multiple friends and family have told me how much they like this cream for the cold weather; in fact, I’ve heard multiple people say it “saved their skin”. It’s a white “creamy” cream but it sinks in quickly without leaving a greasy residue, and it’s very moisturizing for dry and chapped skin. It’s also very reasonably priced and yay, you can get it on Amazon Prime if you’re in a rush! I realize this gift guide comes a little late for shipping from Korea, but luckily many of these kbeauty gifts can be shipped from Amazon Prime via 2-day shipping. I totally meant to get this post up much earlier, but a family illness put a little kink in my plans (everything is better now though). Are you guys all caught up on holiday shopping? I think I’m about done, thank goodness! Now I can relax and enjoy spending time with my family! Have a wonderful holiday, beauties!